Batumi 2018: “Water Sno” will be the sponsor of the Olympiad! The 43rd World Chess Olympiad has one more sponsor – “Water Sno”! 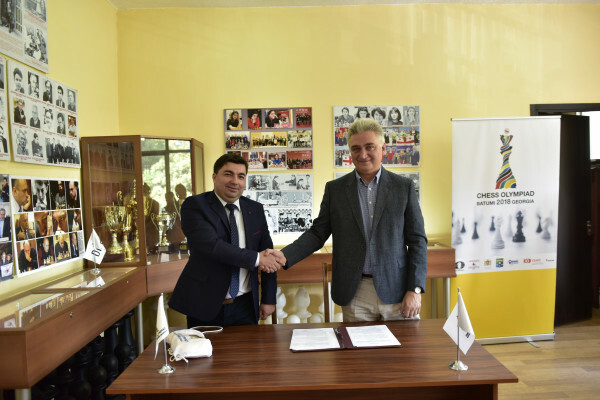 Giorgi Giorgadze, the Chairman of the Organizing Committee of the Olympiad and Giorgi Jirkvalidze, the General Director of "Aqua Geo" – the company producing "Water Sno", signed a cooperation agreement today at Nona Gaprindashvili Chess Palace in Vera Park. "I am happy that our chess family has one more supporter. Soon, Batumi will host the most large-scale tournament, with around 4000 guests from 189 countries of the world, many famous chess players will arrive and I'm sure "Water Sno" will help the Georgian team to succeed. I am also certain that all the guests of the Olympiad will be very pleased with this wonderful water", - said the president of the Georgian Chess Federation Giorgi Giorgadze. Company "Aqua Geo" is pleased to cooperate with the Organizing Committee of the 43rd World Chess Olympiad. Georgian chess has great past and we hope that "Water Sno" will help our athletes achieve new wins", - said Giorgi Jirkvalidze, the General Director of “Aqua Geo ". A month ago, another successful Georgian company became a sponsor of the Batumi Olympiad – tea “Gurieli”. The official document was signed at the Chess Palace as well. The 43rd Chess Olympiad will be held from September 23 to October 5 in Batumi. Batumi won the right to host the largest sporting tournament in 2014 at the General Assembly of the World Chess Federation (FIDE) held in Tromso, Norway.